aging, neurosensory hearing loss, central hearing loss, presbyacusis. Introduction: In the trial of aging all the structures of the organism are modified, generating intercurrences in the quality of the hearing and of the comprehension. The hearing loss that occurs in consequence of this trial occasion a reduction of the communicative function, causing, also, a distance of the social relationship. Objective: Comparing the performance of the temporal auditory processing between elderly individuals with and without hearing loss. Method: The present study is characterized for to be a prospective, transversal and of diagnosis character field work. They were analyzed 21 elders (16 women and 5 men, with ages between 60 to 81 years) divided in two groups, a group "without hearing loss"; (n = 13) with normal auditive thresholds or restricted hearing loss to the isolated frequencies and a group "with hearing loss" (n = 8) with neurosensory hearing loss of variable degree between light to moderately severe. Both the groups performed the tests of frequency (PPS) and duration (DPS), for evaluate the ability of temporal sequencing, and the test Randon Gap Detection Test (RGDT), for evaluate the temporal resolution ability. Results: It had not difference statistically significant between the groups, evaluated by the tests DPS and RGDT. The ability of temporal sequencing was significantly major in the group without hearing loss, when evaluated by the test PPS in the condition "muttering". This result presented a growing one significant in parallel with the increase of the age group. Conclusion: It had not difference in the temporal auditory processing in the comparison between the groups. The hearing is a fundamental sense of life as it is the basis of human communication allowing the insertion of the individual in society. The audio system allows the processing of acoustic events whose function is to select the sounds of speech rather than competitive factors such as noise (1). In the aging process all structures of the body are modified gradually leading to complications in the quality of hearing and understanding (2). Presbycusis, hearing loss that occurs as a result of this process is associated with reduction of communicative function and thus removal from society (3). This condition is caused by deficiency in the blood supply of the inner ear causing degenerative lesions of the organ of Corti, spiral ganglion, the nerve pathways and centers and bulbar suprabulbar. The audiology framework is characterized by sensorineural hearing loss, bilateral and descending committing or not, the speech recognition (4). Furthermore, it occurs progressively with individual variations. Besides hearing loss, it is possible to observe changes in cognitive functions that, in the elderly, is characterized by slow suggesting a deficit in transmission of temporal processing (5). The temporal processing, in turn, is the ability to process acoustic events necessary minimum to speech perception (discrimination of the traits of loudness and duration of consonants) and music (perception of musical notes and scales) resulting in a fundamental component a greater capacity for auditory processing (6,7). The interest in examining the relationship between aging and auditory temporal processing has been growing in recent years due to the existence of elderly people who often complain of difficulty understanding speech not related with the degree of hearing loss. Thus, while some elderly people with difficulties to detect low intensity sounds say they have difficulty understanding speech, particularly in situations of competition sound, other seniors; with obvious hearing loss do not always exhibit such problems. Recent studies have shown that such difficulties with speech recognition may be related to the aging process (8). The auditory temporal processing can be divided into four subcomponents or abilities: spatial and temporal sequencing, discrimination or resolution temporal summation or temporal integration and temporal masking. This study are addressed only the first two, because the latter are not clinically assessed (7). The ability of temporal sequencing refers to the processing of two or more auditory stimuli in the order they occur in time. This is much investigated due to its importance in speech perception depending on the integrity of both hemispheres, for patients with section of corpus callosum may show deficits in standard tests of frequency and duration (6). The most widely used tests to assess this subcomponent are: standard test frequency and duration pattern (7). The frequency pattern test consists of the presentation sequence of 3 tones that differ in height. The frequencies used are: 1430 Hertz (Hz) for the distinction of sound high and 880 Hz for the bass sound. The patient is instructed to murmur and / or name the pattern. Likewise, the test duration pattern also is the submission of 3 tones that differ in duration (250ms) to identify the sound and short (500ms) to identify the long sound (6.9). Both tests are sensitive in identifying complications hemispheric and inter-hemispheric and remain unchanged in case of peripheral hearing loss (6,7). The temporal resolution is the second skill involved in this study, defined by the identification of small intervals of time during which the individual can discriminate between two signals. The minimum interval recognized by the patient is called temporal resolution threshold of being the temporal auditory acuity. Currently, there are two temporal resolution tests available for clinical use: The Randon Gap Detection Test (RGDT) and Gaps-In-Noise (GIN). This study will address only the first (7). The RGDT (Randon Gap Detection Test) is a test of temporal resolution that involves the presentation of a binaural gap inserted in pure tone frequencies of 500 Hz to 4000 Hz The objective of this test is determining the smallest time interval that can be detected by the patient in milliseconds (ms) and obtained by perceptions of a series of paired stimuli. The interval of silence between each pair of pure tones increases and decreases the duration randomly varying intervals between 0.2 ms, 5 ms, 10 ms, 15 ms, 20 ms, 25 ms, 30 ms and 40 ms. The determination of the threshold is calculated by the arithmetic mean of the gap detection thresholds obtained at frequencies tested (6). Currently, research is being undertaken with the purpose of investigating the central auditory abilities in the elderly with and without normal hearing (5.10). Given the literature cited, the purpose of this study is to compare the performance of a group of elderly people with normal hearing and with sensorineural hearing loss in relation to the skills of sequencing and temporal resolution. This study was approved by the Ethics Committee of the Institution in which it was conducted under protocol number 123/2008 and is characterized by a field study, transversal and prospective diagnostic character. After clarification of the research objectives, the participants signed a consent form (ICF). All individuals 60 years or older who sought the Integrated Clinic of the Institution for the audiologic evaluation with a medical have been invited to participate. All elderly people with normal hearing or hearing loss restricted to isolated frequencies with an average of 500Hz, 1000Hz and 2000Hz normal and elderly with sensorineural hearing loss ranging from mild to moderately severe, were invited to participate. All others were excluded from the search. After fit on the criteria for inclusion, the elderly performed the exams and tests proposed in this study. The sample consisted of 21 elderly, 16 women and 5 men aged 60 to 81 years when considering all the participants divided into 13 elderly people with normal hearing or hearing loss restricted to isolated frequencies with an average of 500Hz, 1000Hz and 2000Hz and normal 8 elderly patients with sensorineural hearing loss ranging from mild to moderately severe. The standard tests of frequency and duration were made in dichotic condition and requested responses murmur and appointment, and 10 items for each form of response total of 20 items for each test. Assigned to each value of 10% to 100% response in each condition. We opted for this form of realization that the evaluation process was not thorough in considering the age group under study (9). The test was also performed in RGDT dichotic condition and consists in identifying a gap in pure tone frequencies of 500Hz to 4000Hz whose intervals range from 0 to 40 ms. Join the minimum perceived by the patient at each frequency (13). The whole evaluation process lasted approximately one hour. The sample consisted of 16 women (76.19%) and 5 men (23.81%). To facilitate the analysis participants were divided into two age groups, the first being 60 to 69 years and the second equal to or greater than 70 years. The first track consisted of 11 (52.38%) and the second, 10 (47.62%). When considering the entire sample, the average age of participants was 69.67 years and the minimum age 60 years and maximum 81 years. Regarding diagnostic audiological 13 (61.90%) participants had normal hearing or hearing loss limited to high frequencies with an average of 500Hz, 1000Hz and 2000Hz in the normal range while 8 (38.10%) had hearing loss with varying degrees from mild, moderate and moderately severe (12). Regarding the aspects mentioned in the anamnesis 15 (71.43%) participants did not mention complaints of hearing loss, but 6 (28.57%) referred to it. The same rate of frequency was found for discomfort to loud sounds and occupational noise exposure. Ten (47.62%) participants did not complain of tinnitus, an aspect mentioned by 11 (52.38%). Furthermore, 14 (66.67%) elders did not mention complaints of dizziness, point mentioned by 7 (33.33%). For complaints of family history and speech recognition in competitive situations, 16 (76.19%) participants did not complain of these aspects while 5 (23.81%) presented. These data can be viewed in Table 1. 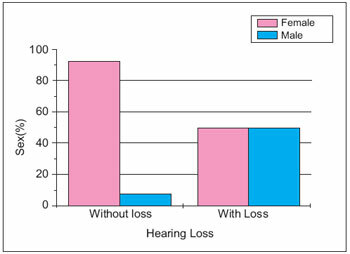 Regarding the comparison of variables in this study between the group with hearing loss (sensorineural hearing loss, mild, moderate or moderately severe) and the group without hearing loss (auditory threshold nor or more hearing loss limited to high frequencies) it was found that gender Women have higher incidence of normal hearing or hearing loss limited to high frequencies while the males had a higher incidence of sensorineural hearing loss, mild, moderate or moderately severe and p = 0.048. The complaint of hearing loss variables p = <0.001, occupational noise exposure p = 0.014 and time of hearing loss p = 0.001 statistically significant when comparing the groups with and without hearing loss. As the hypothesis of this research sought to examine the comparison of both groups in tests of auditory processing. Table 2 shows this comparison for the tests PPS and DPS while Table 3 shows the same comparison for RGDT. Thus, there is a lack of statistically significant for those tests to compare both groups. When comparing the study variables between the genders there was a greater incidence of normal hearing and hearing loss at high frequencies for females and sensorineural hearing loss from mild to moderately severe for males. It is worth mentioning that this analysis was performed separately for each ear, and this result corresponds to the right ear p = 0.045. The same comparison performed for the left ear was not statistically significant P = 0.164. 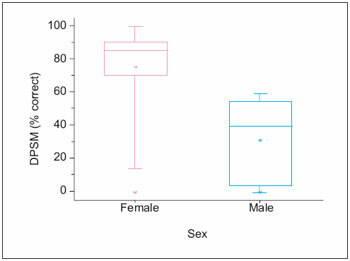 Even with regard to the comparison between genders was observed lower percentage of correct responses for the male test DPS provided muttering (p = 0.008). Moreover, the time of hearing loss was also statistically significant being higher in males (p = 0.049). When comparing the study variables between the age groups there was a statistically significant difference for the PPS test provided murmuring, a lower percentage of correct answers for the age group between 60 and 69 years, p = 0.043. Likewise, to correlate numerical variables showed a significant correlation between age and test performance PPS provided muttering that performance in this test increases with advancing age (r = 0.455 and p = 0.038). This study aimed to compare elderly individuals with normal hearing and with sensorineural hearing loss in relation to temporal processing. It is worth mentioning that the number of participants is limited, so the considerations pointed out must be interpreted with caution. Most of the sample of female subjects due to high demand by the early audiological diagnosis compared to men. This finding concurs with a study that found lower participation of men in the services of primary health care. In general, suffer more severe conditions and chronic health than women and therefore the same die (14). This fact refers to the phenomenon of feminization of aging. Thus, studies in this population has increased participation of women. 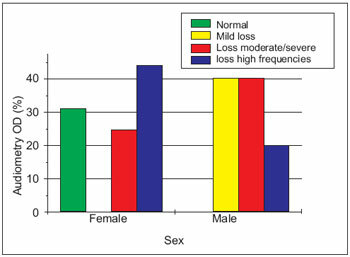 Another study showed a significant increase in prevalence of hearing loss with increasing age, but it is noted that prevalence rates are different in each study due to methodological differences logical and there seems to be a slight tendency for men to have higher prevalence of hearing loss at different ages than women (3). The diagnosis of hearing loss in participants of this study was consistent with the complaint and the time of hearing loss suggesting that the worsening of the condition is associated with complaints of hearing loss. This finding agrees with a study that compared self-report with the audiological diagnosis suggesting a positive correlation. The authors also show that self-report may be a quick and cheap way to provide estimates in large populations, where the costs (audiological equipment and human resources) and time constraints are factors that hinder the achievement of a more accurate diagnosis. Thus, the self-report may be an indicator of loss (15). The aging process compromises the hearing sensitivity and can lead to psychosocial complications. The loss of this sensitivity refers to the concept of presbycusis may be aggravated by extrinsic factors such as exposure to occupational noise and non-occupational, nutrition, stress, medications, along with hereditary factors (2,16). In this study it was found that most participants were men with hearing loss and that the comparison between groups with and without hearing loss with the complaint of occupational noise exposure was significant. Thus, it appears that the hearing loss in the elderly may be aggravated by other factors as mentioned by the studies cited. The results related to auditory processing tests showed no significant relationship between subjects with and without hearing loss, but it is possible to observe differences in relation to performance. It was considered the normal range of 76% correct for the PPS test for conditions mumbling and styling. Thus the performance of the group without hearing loss was minor compared with the normal range for both conditions. In the group with hearing loss there was an increase in performance in both conditions. Provided murmuring, the participants' average is above the normal range remaining, only the naming condition below average. In the DPS test is considered normal range of 83% correct for both conditions. It is observed that the performance of both groups is below average and the murmuring condition in the group with hearing loss is higher than the group without loss, unlike the naming condition, that even below average is higher in the group without hearing loss. Comparing the performance in both tests it was found that test performance is superior to PPS DPS. Both tests assess the ability of processing temporal sequencing (6,7). Thus, the difference in performance suggests the involvement of other functions. The difference frequency is primarily due to the tonotopic organization of the cochlea that is repeated along the ascending auditory pathways while the distinction of duration involves the learning of the concept of short and long sound beginning in the brainstem. Thus, the processing of rapid change in duration is more specialized and mediated by the left hemisphere while the variation in frequency would be mediated by the right hemisphere. Another hypothesis is the involvement of the cerebellum in the identification of standard length. Therefore we conclude that the distinction of length is an activity that requires more brain functions to compare it with the distinction of frequency (17). Also, found a study in which participants' performance was superior in standard length (11). For RGDT, which assesses the ability of temporal resolution, it was considered the same pattern of normal (4.77 ms to 11.69 ms) seen by a recent study (18). It is worth noting that no studies were found with the elderly in normative large scale as regards the skill assessed. In this study, the results of this test were not submitted in milliseconds, rather emphatically due to the difficulties of the elderly in testing. Thus, the participants' performance was considered to be normal or altered if it were outside that range. As shown in Tables 2 and 3 the vast majority of participants showed changes in the test in both groups suggesting that performance in the temporal resolution ability, assessed by RGDT is lower than the temporal sequencing (7). When considering both abilities, both the sequencing and temporal resolution were not statistically significant when comparing the groups with and without hearing loss, unlike other studies in which hearing loss was determinant for the difference in answers or that the results were not significant but showed tendency to underperform in the presence of hearing loss (5,10). It is worth noting that these studies were performed with different tests that assess other skills. At this point, we agree with the work that oppose the interference of peripheral hearing loss (6, 7) and a review of the literature that suggests the existence of temporal auditory processes of varying complexity, which can be affected both by intercurrent Hearing peripheral and central auditory system, even in areas of cognition is not exclusive of hearing (8). In relation to this sample suggests that the results are suggestive of the aging process and not the peripheral hearing loss. Recent studies have shown that the difficulties with speech recognition may be related to loss of ability to perform temporal processing in aging (5,8). When comparing the study variables between the genders, we observed a higher incidence of normal hearing and hearing loss restricted to higher frequencies for women and sensorineural hearing loss for men. These results were obtained by ear is only significant in the right ear. This suggests that further studies of temporal processing should be performed in monotic condition as shown in a survey of the same tests (11). The authors also found more easily to the answers provided murmuring, a finding also identified in this study, however, superior performance of responses for men, given that no support to this research, because it was found lower performance in DPS for men provided murmuring. This result may have been influenced by hearing loss, with a maximum occurrence was found for males. This result differs from that found in the literature that evaluated subjects with normal hearing emphasizing thus the association with hearing loss. Another study that surveyed the auditory processing of military personnel exposed to occupational noise with and without peripheral hearing loss showed that both groups exhibited auditory processing disorders, diagnosed through tests of filtered speech and pitch patterns. The group concluded that changes in tests of auditory processing may occur prior to peripheral hearing loss (19). In the comparison and analysis of correlation between age and the variables studied was found superior performance on the test PPS provided murmuring, for the age group above 70 years suggests that the performance improved with increasing age when considering the sample. This may be because until 80 years, intellectual ability can be maintained in people without brain damage. The decline in most of the variables that change with age is linear in the eighth and ninth decades (20). Figure 4. 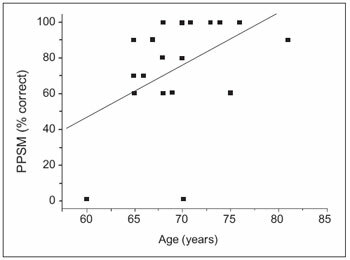 Correlation of test performance PPS provided murmuring ages. - Ppsm: Pitch Pattern Sequence test or standard frequency in murmuring condition. Regarding the sample studied no difference in auditory temporal processing performance between groups. It is suggested that the results are suggestive of the aging process and not the peripheral hearing loss and that the lower performance in men may be linked to hearing loss, as well as the number of elderly males who participated in the study. The superior performance in the PPS test in murmuring condition for the age group above 70 years suggests that performance improved with increasing age for this sample. It is suggested to carry out further studies on temporal processing in monotic condition and the use of the GIN test and the expanded form of RGDT. 1. Frazza MM, Munhoz MS, Silva ML, Caovila HH, Ganança MM. Som e Audição. Em: Munhoz MS, Caovila HH, Silva ML, Ganança MM. Audiologia Clínica 2. São Paulo: Atheneu; 2000. p. 1-10. 2. Russo IP. Distúrbios da Audição à presbiacusia. Em: Russo IP. Intervenção Fonoaudiológica na Terceira Idade. Rio de Janeiro: Revinter; 2004. p. 51-82. 3. Bess H, Hedley-Willians A, Lichtestein MJ. Avaliação Audiológica dos idosos. Em: Musiek FE, Rientelmann WF. Perspectivas Atuais em avaliação auditiva. Barueri: Manole; 2001. p. 343-369. 4. Kós AO, Kós MI. Etiologia das Perdas auditivas e suas características audiológicas. Em: Frota S. Fundamentos em Fonoaudiologia. Rio de Janeiro: Guanabara Koogan; 2003. p. 123-140. 5. Pinheiro MM, Pereira LD. Processamento auditivo em idosos: estudo da interação por meio de testes com estímulos verbais e não- verbais. Rev Bras de Otorrinolaringol. 2004, 70(2):209-14. 7. Shinn JB. Temporal processing and. Temporal patterning tests. Em: Musiek FE, Chermak GD. Handbook of (central) auditory processing disorder: suditory Neurocience and diagnosis. San Diego: plural publishing; 2007. p. 231-256.8. 8. Neves VT, Feitosa MA. Controvérsias ou complexidade na relação entre processamento temporal auditivo e enve-lhecimento. Rev Bras Otorrinolaringol. 2003, 69(2):242-9. 9. Auditec. Evaluation Manual of. Pittch Pattern Sequence and. Duration Patern Sequence . Missoure: USA; 1997. 10. Quintero SM, Marotta RM, Marone SAM. Avaliação do Processamento de indivíduos idosos com e sem presbiacusia por meio do teste de reconhecimento de dissílabos em tarefa dicótica - SSW. Rev Bras Otorrinolaringol. 2002, 68(1):28-33. 11. Parra VM, Iório MC, Mizahi MM, Baraldi GS. Testes de Freqüência e duração em idosos com sensibilidade auditiva normal. Rev Bras Otorrinolaringol. 2004, 70(4):517-23. 12. Davis H, Silverman SR. Aearing and Deafness. 3 ed .New York: Holt, Rinehart and Winston; 1970. 13. Keith R. Random gap detection test. St Louis (MO): Auditec; 2000. 14. Gomes R, Nascimento F, Araújo FC. Por que os homens buscam menos os serviços de saúde do que as mulheres? As explicações de homens com baixa escolaridade e homens com ensino superior. Cad. Saúde Pública. 2007, 23(3):565-574. 15. Rosalino CM, Rozenfeld S. Triagem auditiva em idosos: comparação entre auto relato e audiometria. Rev Bras Otorrinolaringol. 2005, 71(2):193-200. 17. Costa-Ferreira MI. A influência da terapia do processamento auditivo na compreensão em leitura: uma abordagem conexionista [Tese]. Porto Alegre: Pontifícia Universidade Católica do Rio Grande do Sul; 2007. 18. Zaidan E, Garcia AP, Tedesco ML, Baran JA. Desempenho de adultos jovens normais em dois testes de resolução temporal. Pró fono- Rev Atual Cient. 2008, 20(1):19-24. 19. Santos CC, Juchem LS, Rossi AG. Processamento Auditivo de Militares Expostos a Ruído Ocupacional. Rev CEFAC. 2008, 10(1):92-103. 20. Cançado FA, Horta ML de. Envelhecimento Cerebral. Em: Freitas EV de. Py L, NeriAL, Cançado FAC, Gorzini ML, Rocha SM. Tratado de Geriatria e Gerontologia cap.13. Rio de Janeiro: Guanabara Koogan; 2002. p. 112 - 127. 1. Bachelor's Degree in Speech Pathology. Speech. 2. PhD. Professor of Speech Methodist University Center - IPA - Porto Alegre and the School Our Lady of Fatima - Caxias do Sul. Instituition: Centro Universitário Metodista - IPA. Porto Alegre / RS - Brazil. Mail Address: Maria Inês Dornelles da Costa Ferreira - Rua Luiz Afonso, 158/702 - Cidade Baixa - Porto Alegre / RS - Brazil - ZIP CODE: 90050-310 - Telephone: (+55 51) 9823-0198 - E-mail: costa.ferreira@terra.com.br or maria.ferreira@metodistadosul.edu.br. Article received in March 2, 2010. Article approved in March 13, 2010.